Our annual report into the use of the Mental Health Act (MHA) tells you about the experiences of patients who received care under the act throughout 2013/14, and also recognises the act's 30th anniversary and the five years since CQC have been responsible for keeping the act under review. 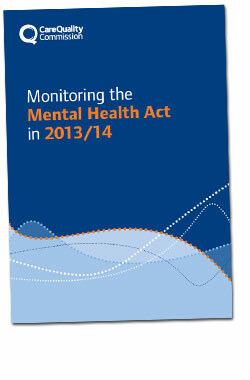 Uses of the Mental Health Act have grown. At the end of 2013/14, there were 23,531 people subject to the act, either detained in hospital or under a community treatment order. This represents an increase of 6% from 2012/13. As the number of detained patients continues to increase, we continue to make sure that health and social care services provide them with safe, effective, compassionate and high-quality care. During 2013/14, we carried out 1,227 MHA monitoring visits, meeting more than 4,500 patients, and our MHA Reviewers carried out 174 inspections with the mental health inspection teams. Our inspections highlighted the variation of care provided to detained patients. Too often we found services that are not routinely involving patients in their treatment. In addition, we are concerned with the issue of bed availability and the increasing number of patients being detained far away from home. 4,517 detained patients interviewed by a MHA Reviewer. 175 patients on a community treatment order interviewed by a MHA Reviewer. 13,645 patients assessed by our Second Opinion Appointed Doctors. 1,227 MHA visits completed and reports issued to providers. 174 inspections included a MHA Reviewer on the inspection team. 1,324 mental health wards visited by our MHA Reviewers. 24 community treatment order visits. 47 seclusion and long-term segregation visits. 49 MHA visits to high security hospitals by our MHA Reviewers. 1,016 complaints and enquiries about the MHA received and responded to. 240 notifications received for patients who died while detained. 909 notifications for patients who were absent without leave. Independent Mental Health Advocacy (IMHA) services are an important safeguard for detained patients. However, we found that many local authorities are not conducting a needs assessment before commissioning these services. This is worrying and could mean that not everyone who needs it has access to an advocate. We are also concerned that we are still seeing examples of poor practice in restrictive practices, particularly seclusion and long-term segregation. Providers must ensure that people, and their families or carers, understand their legal rights and are involved in their treatment. Local policies, training and audits should help staff to understand the specific needs of people and their families or carers, while hospital managers should work jointly with other services, including local IMHA providers. Following the publication of the revised Code of Practice in January 2015, we also encourage all providers and commissioners to work together to develop a plan for implementing the new Code that will improve the experience and outcomes for people subject to the MHA. In addition, CQC expects commissioners and providers to use the local data available from the use of the MHA and work together to plan services that meet the needs of patients. They should pay particular attention to the issues we have highlighted in this report. We also encourage services to look at their systems and make sure that providers are completing returns to national datasets. This information is essential to help inform local and national improvements to patient care by policy makers, commissioners and providers who use the data to understand the state of care for people affected by the Act. CQC is committed to further strengthening our inspection and monitoring approaches for the MHA. As part of our comprehensive inspections we will review providers’ application of the MHA, and assess their governance systems and processes. We will look at how we can use our new approach to meet a wider range of people affected by the MHA. Our inspection teams will look at how the MHA is being delivered. This includes reviewing how providers monitor their use of the MHA, such as carrying out audits for local needs assessments. We will be looking for evidence that the issues we raise through our inspections, on behalf of patients, are considered by board members and used to inform local action plans. And we will review our MHA monitoring visits so that they are more focused on patient rights, the experience of being detained and the principles of the MHA. We will continue to monitor the implementation of the revised Code of Practice. We will work with the Department of Health and others to learn from Code of Practice consultation responses, and to shape our own approaches to regulating and monitoring the MHA. Many of the proposals for change we made to the Department of Health during the consultation are reflected in the new Code. These changes should help patients to understand what happens when they are detained under the MHA, and to challenge services when they do not receive good care. We are aware of the increasing financial challenges in health and care services. As a result, we will be looking at how we can understand the impact of these on local services going forward. We will also continue to review how we evaluate our MHA activities, how we can continue to improve our role, and how we can encourage improvement for patient care as a result. You can order our print publications online or by calling 03003 230 200.